The Handmaid’s Tale – An adaption of the novel written by Margaret Atwood that was originally published in 1985. It is a dystopian novel which is set in the future (not sci-fi future) where people live in a totalitarian state which overthrew the US Government. 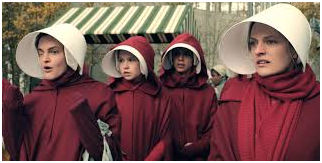 The story follows the life of Offred who is a handmaid. They are forbidden from using their birth name and instead use a name which links to the name of their master for whom they are a servant. The handmaid’s are essentially forced into a servant style life and they are forced into child-bearing service. Line of Duty – A long running series having first aired in the summer of 2012. This police drama follows the work and lives of a unit of anticorruption officers known as AC-12. It is now on its fourth series and has been commissioned for a further two. Peaky Blinders – This drama is set in 1920s post war Birmingham and follows the lives of the Shelby crime family. The first series aired in 2013 and it was recently announced that a fifth series has been ordered for broadcasting in 2019. Each series picks up where the previous one has left off. The show was called Peaky Blinders after the well-known Birmingham gang who used to sew razor blades into the peak areas of their caps. 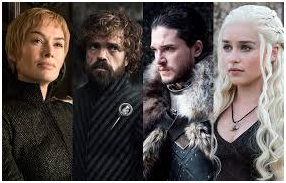 Game of Thrones – Is an American fantasy drama which has been incredibly popular both as a book series and now as a television series. There are nine families of nobility who are all fighting over Westeros which is a mythical land. Conflict is rife between the families and whilst they are busy fighting between themselves they are less aware of an ancient enemy that is slowly rising and determined to destroy them all. Are you a fan of any of the series mentioned above? Whatever type of programs you like to watch their really has been a drama series for everyone in 2017.